Wychwood Boot Bag a safe and hygienic way of transporting dirty footwear, created using the unique Drop Dry System, which allows boots to dry conveniently inside the Wychwood boot bag. 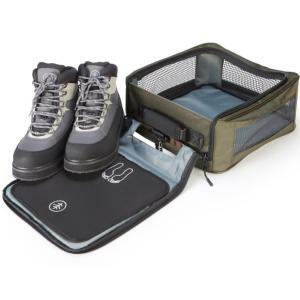 Wychwood Boot Bag is a high quality walking boot or wading boot bag made from a hard-wearing waterproof 1680D and 840D material featuring an easy change neoprene mat for standing on when changing footwear outdoors. The bag is a safe and hygienic way of transporting dirty footwear, created using the unique Drop Dry System, which allows the footwear to dry conveniently inside the Boot Bag when stored after use. Featuring a new convenient carbineer clip allowing the bag and boots to be hung up so that ventilation is easily achieved. A simple, no-fuss solution to storing dirty footwear. 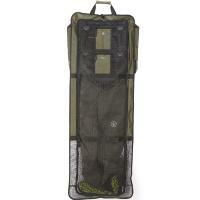 This is the best innovation with mesh and neoprene for handling waders and wading shoes. 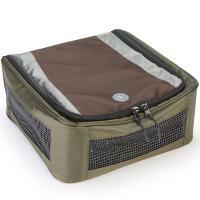 Thanks a lot for realising this Boot Bag.